"Very nice rooms, clean with air conditionated, good wifi on all rooms, private bathrooms and everything new. The staff is friendly and the hostel is close to aa lot of historical buildings. It is near clubs and bars for people who like nightlife." 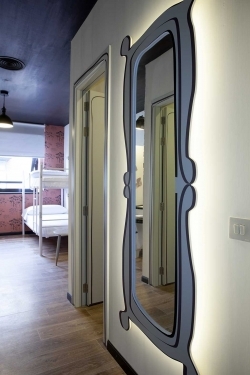 Hostel Room 007 Ventural is located right in the centre of Madrid, at a few metres from the symbolic Puerta del Sol and the Santa Ana Square. 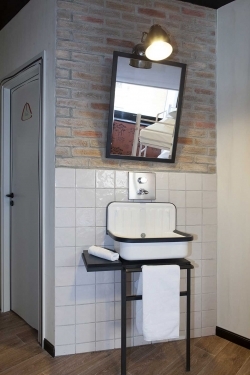 It offers 8 rooms completely equipped with a private bathroom with towels, shower gel and shampoo. In order to make your stay more comfortable, we offer a kitchen and a bar-restaurant, ideal to have a drink while you enjoy theatre performances or Jazz concerts. It also has a terrace with solarium and a living room where you can enjoy a good film. From the Airport Option 1: Shuttle Bus - Get the bus from any of the terminals of the airport, and you will get to Cibeles Square. From there take Alcalá Street, in direction to Sol, and then to the left to Cedaceros street, and again left to Ventura de la Vega Street. You can also take the metro at Banco de España station in Cibeles Square, until Sevilla metro station. Then take Cedaceros streets and then Carrera de San Jerónimo. The second street on the right is Ventura de la Vega. Option2: Cercanias Train, from Terminal 4. Drop off from the train at Sol station, from there take Carrera de San Jerónimo street, in around five minutes you will reach Ventura de la Vega street. "No negative points. The hostel is amazing!" "I had a great time at this hostel. It was the first time I tried a hostel and I enjoyed it. We went on a organized pub crawl with Pablo and had a great time." "Everything was clean and room was spacious. The wifi worked extremely well and front desk staff were all helpful and friendly!" "Aircon in the room could not be adjusted it was a bit too hot to my liking but I usually like it very cold, so might have been perfect for someone else." "The staffs are very nice and helpful! We had a free Sangria party that night,on the 4th floor .And we played a game with cards.Very fun!Perfect location,5min walk to Sol!Unique design!!FANTASTIC!"